While it’s generally advisable for excessive drinkers to detox in a medically supervised setting, those with less history of binge drinking may be able to detox at home under very limited circumstances. Alcohol use disorder (AUD) is characterized by the increased dependency on alcohol to feel normal, and the onset of varying levels of withdrawal symptoms when forced to go without it. AUD creates serious and potentially permanent changes in the brain’s chemistry and the central nervous system, and the longer excessive drinking continues, the worse these symptoms and changes are likely to become. The Mayo Clinic, as well as various other leading healthcare authorities, reports that alcohol use disorder can range from mild to severe. By the time alcohol abuse rises to the level of full-blown dependency, it is highly recommended that AUD sufferers get the help they need in a legitimate treatment center, including detox and rehab. The American Psychiatric Association’s Diagnostic and Statistical Manual (DSM) has long been regarded as the leading set of guidelines for the diagnosis and treatment of substance abuse disorder and other types of mental disorder. It is the product of exhaustive collaborative research and clinical exploration. Until very recently, the DSM distinguished between alcohol abuse and addiction; however, the most recent version of the document combines the two into a diagnosis of alcohol use disorder. Why do these criteria matter? They can directly inform whether your drinking is at the point of needing professional intervention or can be mitigated through at-home detox. Very often, binge drinkers will get a painful and glaring signal that their drinking has gotten out of control through the onset of physical and psychological withdrawal symptoms. The scope and duration of alcohol withdrawal can be a primary indicator of whether or not one can safely detox at home or they need help with their symptom management. Generally speaking, alcohol withdrawal can be divided into three stages: early, acute and protracted. If treated, withdrawal usually lasts for five to seven days; however, untreated alcohol withdrawal can last for weeks, and usually cause drinkers to relapse. More serious symptoms experienced by severe alcoholics can include shaking, tremors and seizures, which will require medical intervention. It’s important that patients who have incurred serious medical issues related to drinking, such as jaundice, cirrhosis, or liver or heart disease seek professional withdrawal treatment, as withdrawal can further exacerbate these potentially life-threatening conditions. When Is It Safe to Detox at Home? 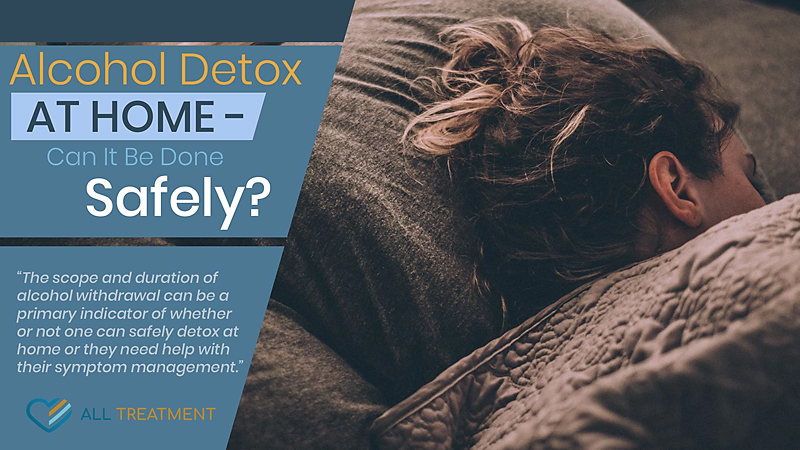 Simply put, it’s safe to detox at home before withdrawal symptoms get too severe and dependency sets in, as is often the case for drinkers with a more abbreviated history of binge drinking (teenagers, adolescents, younger adults, etc.). Isolated incidents of binge drinking can be managed at home with the help of over-the-counter medications, sleep and other everyday remedies. However, the withdrawal periods that accompany chronic alcohol abuse will usually require medical management. Naltrexone and acamprosate to treat patients with moderate to severe alcohol use disorder in specific circumstances (e.g., when nonpharmacological approaches have not produced an effect or when patients prefer to use one of these medications). Disulfiram, which produces physical reactions (e.g., flushing) if alcohol is taken within 12-24 hours of the medication’s use, and is not generally used as a first-line treatment. Topiramate and gabapentin, which are also suggested as medications for patients with moderate to severe alcohol use disorder, but typically after trying naltrexone and acamprosate first. 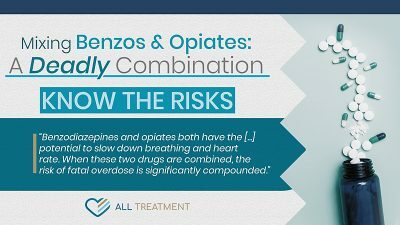 Be sure to speak with your physician or treatment professional prior to taking any medications for AUD. It is undoubtedly tempting to detox at home rather than at a treatment facility or medical center. The comfort, discretion and dignity that home offers is an appealing notion; however, it’s also very often a comparatively ineffective one. Medically supervised detox for alcohol withdrawal offers a safe, comfortable and discreet environment to heal, as well as experienced and qualified doctors and nurses who can intervene in the event of a medical emergency and mitigate symptoms. Medical detox is covered by most insurance companies and even state Medicaid subsidies to make the process more affordable and accessible to those who need it. While it’s true that full-blown alcoholics run a heightened risk of relapse if they endeavor to detox on their own, it’s also true that there are varying degrees of alcohol use disorder. Ultimately, it’s best to consult your primary care physician to determine whether or not you’re a candidate for medical detox or if you can ride out withdrawal at home. Your doctor may be able to provide insights regarding at-home remedies to make the withdrawal period easier. Perhaps the most important thing to remember is that once you’ve been through the worst of your withdrawal, you need to either seek behavioral rehab as the next phase of treatment or self-monitor to ensure your drinking doesn’t get out of control.